Home › Legal Questions › Is it legal to work without an employment contract? There is no general requirement in our labour law for an employee to have a formal employment contract which regulates all aspects of the service relationship. All persons regarded as employees according to section 83A of the Basic Conditions of Employment Act, section 200A of the Labour Act, and common law, enjoy the protection of existing labour legislation and labour principles. If a person’s status as an employee turns into a dispute during labour litigation, the matter is settled by the CCMA, the bargaining council for a specific industry, or the Labour Court. The fact that you do not have a formal employment contract, does not mean that you do not have protection, and the question whether someone is an employee is determined according to guidelines and criteria in legislation and common law. 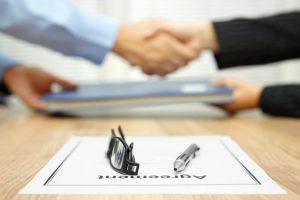 However, it is recommended that employers have employment contracts in place which regulate important aspects of employment, such as job descriptions, working hours, remuneration, disciplinary codes, etc., to avoid unnecessary disputes, and to provide clarity regarding the rights and responsibilities of both parties in the employment relationship. Should there be no comprehensive employment contract, employees are entitled to claim compliance by the employer to section 29, 31, and 33 of the Basic Conditions of Employment Act. a) Full name and address of the employer. b) The name of the employer and his/her job title, or a brief description of the work for which he/she has been appointed. c) The place of work (where work is being done at various locations, a clear indication thereof). e) Normal working hours and days. f) Remuneration, or the hourly fee and the method of how it has been calculated. h) Any other cash payments the employee is entitled to. i) Any goods or services receivable for work done, as well as the value thereof. k) Any deductions from the remuneration. l) Leave the employee is entitled to. m) The required notice period for termination of service, or the date of termination of the employment relationship. n) A description of any bargaining council or sectoral stipulation under which the business operates. o) Any period of employment at a previous employer which counts as a period of employment at the current employer. p) A list of documents which are part of the employment contract, as well as an indication of a place where they are accessible to the employee to obtain a copy. When any aspect of the abovementioned terms changes, it must be done in writing, and the employee must receive a copy of the amended terms. If the employee does not understand the written document, the employer must ensure that the terms are explained to the employee in a language he/she understands and in such a way that the employee fully understands the contents. The written details of employment must be kept for up to three years after termination by the employer. a) The employee’s name and job title. b) The time every employee worked. c) The remuneration of each employee. d) The date of birth of any employee under the age of 18 years. e) Any other information prescribed by legislation or by the Minister of Labour. The abovementioned records must be held for three years as of the date of the last entry in the specific records. No person may enter false information. a) Name and address of employer. b) Name and job title of employee. d) The amount that was paid. e) The amount and purpose of any deductions from the remuneration amount. f) The final amount after deductions paid to the employee. The abovementioned information in writing must be provided to the employee in the workplace, or at a place that was agreed upon between the employer and the employee, and it must take place during the employee’s normal working hours, or within 15 minutes before or after work. Where employers do not want to comply to the abovementioned basic rules regarding recordkeeping, terms of employment and remuneration information, employees are advised to lodge a complaint of non-compliance to the Basic Conditions of Employment Act at the nearest office of the Department of Labour. Unfortunately, it happens that staff members who are responsible for the abovementioned aspects, namely pay slips, employment contracts, and recordkeeping of hours worked, sometimes regard this work as an unimportant administrative task without realising that they are violating employees’ rights and they expose the employer to action by the Department of Labour. Labour inspectors from the Department of Labour has the power to enter the employer’s premises, check records, issue fines for non-compliance, and to give binding orders regarding compliance to employers. If you have any questions about terms of service, employment contracts, or remuneration at your employer, please contact Solidarity’s Call Centre at 0861 25 24 23.